This lightweight and compact tactical flashlight generates an intense and wide cone of light perfect for close-in work in the dark. Ruggedly designed for all-weather use, the solid aluminum construction and the long-lasting CREE Q5 bulb will provide a lifetime of service. Requires 3 AAA batteries, included. 5 1/2"L x 1 5/8"diam. 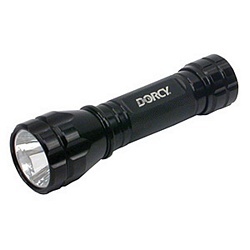 Pros: Bright, brighter than the other similar Dorcy I have with a pushbutton (previously sold by Cyberguys.com, it appears they have stopped selling it though). Large button, very easy to use even with heavy gloves. Internal battery holder is better constructed than the other similar Dorcy sold by Cyberguys.com. Cons: A bit inconvenient to twist the end cap to get a constant on light. If you want all button features (momentary, multiple brightnesses, etc.) you will need to buy a more expensive competing light. I find these other features rarely used. No fast strobe, the only additional feature I'd consider useful-- at night, this really helps get the attention of loony motorists with cell phones stuck in their ears. Other Thoughts: Cyberguys.com really ought to describe the differences between this "tactical" light, and the other similar Dorcy light they sell. The previous light has (or had?) a push button on off button. That light has no momentary button like capability, it clicks on and it is on, or clicks again and it is off. The tactical light has a large button that acts solely like a momentary push button. Press it, the light is on, release the light goes off. If you want the light to stay on without pressing the button in the tail, then you need to screw the end cap all the way in (which, btw, is the method to ensure the light is always off in your kit, unscrew the end cap a few extra times and that disables the button totally). So, which of the two Cyberguys.com lights you want depends on how you want to use it. I find the tactical a bit better for my purposes (and it is brighter), typically I don't keep the light on for long periods. 11 out of 11 find this review helpful.